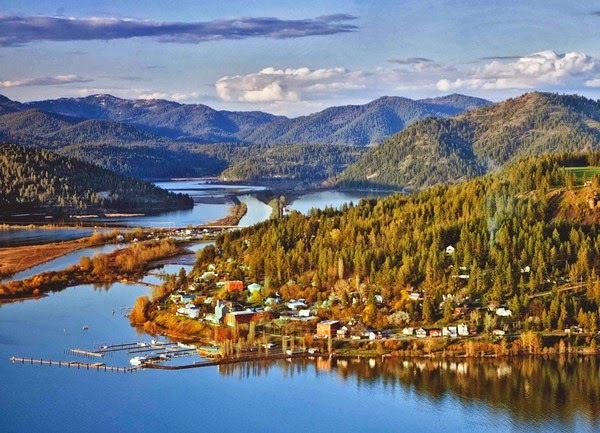 Coeur d'Alene River and Chain Lakes - In Florida there is a chain of Islands called the Florida Keys. 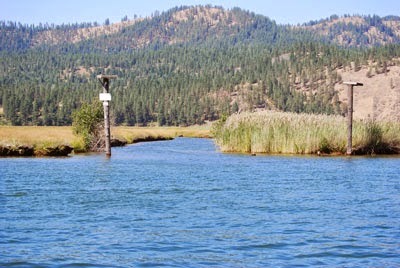 The Inland NW has no competing chain of Islands, but there is a spectacular chain of lakes... beautiful vistas, beautiful lake channels, clear water graced with fish and surrounded by wildlife... a boaters paradise. This assortment of lakes is unlike any other place in the world and the premier jewel of the Inland NW. While on the river watch out for old broken pylons and obstacles like this little Island near the river bank. 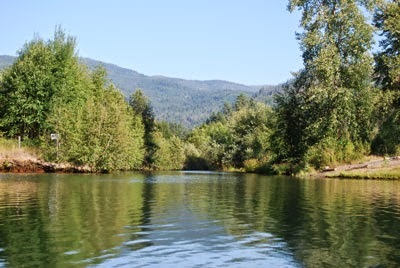 Salmon and Trout levels continue to remain strong on the river making it a popular destination for fishing. Tubing and swimming are also popular activities. Some of the chain lakes aren't popular for water skiing due to limited access, shallow water, and lots of marine vegetation; however, others of the larger and deeper Chain Lakes are popular for water skiing. There are 4 bridges over the Coeur d'Alene river, each providing about 20-30 foot clearance below (official height not known). Seven bridges cross over the channels entering the Chain Lake with clearances as low as 3 to 10 feet. I found only one power line... running over a channel to Thompson Lake; I found none over the river. This does not mean there are none as I could have missed some and there may be power lines running under some of the bridges so be on the lookout, especially if you are taking a small sailboat up the river and into any of the Chain Lake. 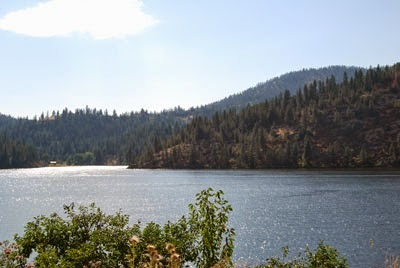 Dante's Peak was filmed on the South Fork of the Coeur d'Alene River and the river city of Wallace, Idaho. 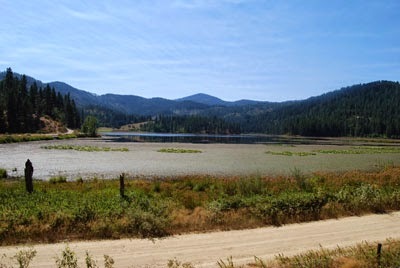 The acid lake scene was filmed on Mirror Lake in Bonner County Idaho. The boat you chose to use on your trip to the chain lakes and river will impact what you can access. For example, two of the chain lakes have low laying bridges of about 4-5’ above the water (depending on the time of year and water height). Most of the channels into the Chain Lakes are 10-20’ wide; so for the average trailer-able run about width or length should not be an issue. But the height and draft of your boat will be an issue in some of the channels and as we discuss each lakes' channel the issues will become clear. 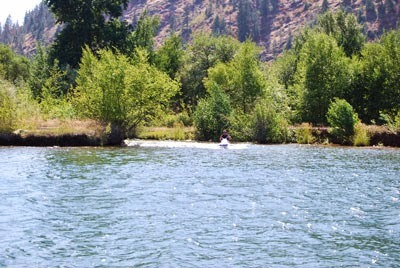 Depth in the river does not become an issue until about 2 miles before the Old Mission on some river bends. After the Old Mission the river has many shallow areas. Three of the lake channels prohibit or limit one from entering the lakes depending on ones boats draft and height above the water line. Two other lakes have no navigate-able channels from the river. 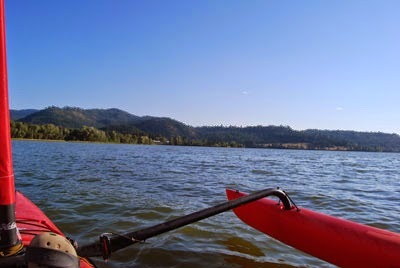 With a Canoe or Kayak you can access 8 of the lakes that have navigate-able channels from the river. 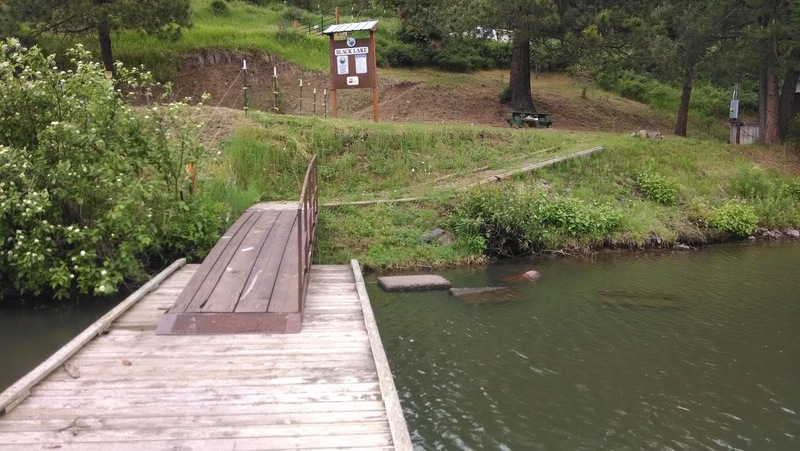 There is a debate among locals regarding whether all 10 lakes should be called the Chain lakes because only 8 of the lakes can be accessed via channels directly from the river. All 10 lakes are very close to the river and all have creeks and or channels that go directly into the river. 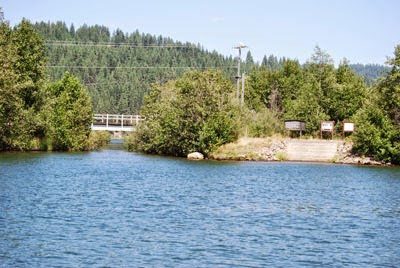 On this website all 10 lakes are called and considered the Coeur d’Alene River Chain Lakes. 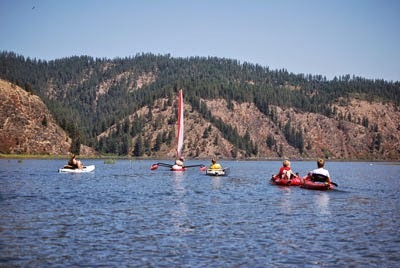 Directions: To access the river and chain lakes you can start in Harrison Idaho or at the primitive River Junction boat launch where the North and South Fork meet the main (Lower) Coeur d’Alene River. In addition there are 8 boat launches on the river, 3 launches in the Chain Lakes, and a slew of other access points. After the River Junction launch there are a few shallow areas that one has to navigate through (not suited for crafts with motors or deep draft), but once at the Old Mission the river gets deeper. Still there are some shallow areas particularly at turns in the river. One hundred foot steamboats use to navigate all the way up the river to the Old Mission. 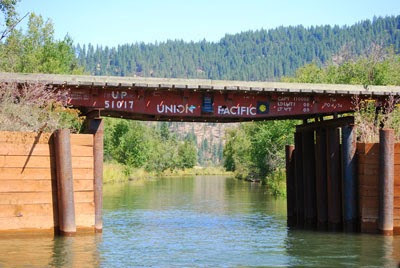 You will see pylons that are still visible from the old docks where people and freight boarded the steamboats on their travels to and from Lake Coeur d’Alene (see the steamboat history in the Lake Coeur d’Alene section… click on this link to learn more). 1. The city of Harrison is at the mouth/outlet of the Coeur d’Alene River (Southwest end of the river) on Lake Coeur d’Alene. The Launch in Harrison can handle most deeper draft boats such as trailerable keelboats or larger cruising powerboats. 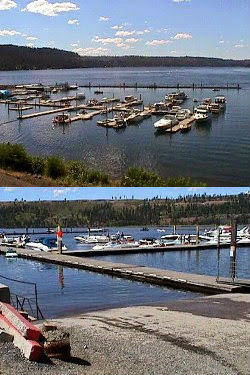 The public dock facilities at the Harrison Marina are excellent and maintained by Kootenai County Parks & Waterways with restrooms, running water (running water is only available in Harrison, Killarney Lake facility, and the Old Mission, and at the exit 34 junction gas station/restaurants), and the ONLY pump-out stations is in Harrison. Fuel may or may not be available at Harrison marina so fill up your boat and vehicle before boating on the Coeur d’Alene River. The nearest gas station is at exit 34 on I90 & HWY 3 junction or in St. Marries some 30 miles away. In addition there is a city run RV and camp ground down by the private marina. The town of Harrison during the summer particularly has several wonderful restaurants, a grocery store, and lots of festivals. Go to http://www.harrisonidaho.org to learn more about this city and its annual activities. ACCESSIBILITY: PARKING... Gravel parking lot; PATHS/TRAILS... No developed paths/trails; RESTROOMS/FACILITIES/SHADE… No restrooms. Shade via trees; DOCKS/LAUNCHES/PLATFORMS… No dock/platform. Paved single lane cement launch at about 6% grade; DIRECT WATER ACCESS… No developed access for wheeled mobility devices. Absolutely no access to water other than via launch; TRANSFER SYSTEMS... None; SENSORY... No sensory tactile markers for those with visual and other impairments; CAMPING... No; O.T.H.E.R… Oddities/Barriers: Mud and rocks along shoreline; Terrain: Level to 6% grade at launch; H2O/Water: Water murky until. Water temperature in the summer can be around 60 to 70 degree. No drinking water available; Environmental Conditions: Varies; Resources: Food, drinks, and gas in town of Harrison, ID. channel and lake you will come to is Anderson Lake... the largest of the chain lakes at 720 acres. 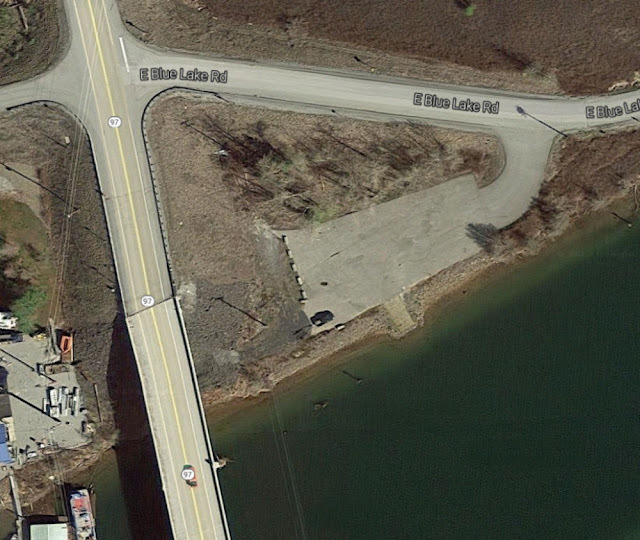 The channel is fairly easy to find because it is right after the HWY 97 bridge (the first bridge you will come to. There is also a boat launch next to this bridge) on the right (E.). This channel entrance has a small bridge with the name of the lake on it. 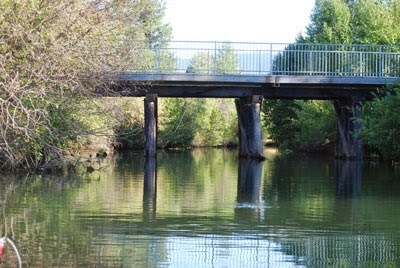 The Trail of the Coeur d’Alene bike trail runs the full length of the river chain lake system on the east side; thus, any lake on this side of the river has a bike bridge over the channel. The channel height limit due to the bridge is about 5’ high and 10’ wide (all measurements are estimates so don’t quote me) with a depth of about 4’- 6’ (very tight fits for some mid draft boats.) When entering into a lake (from all the channels) be sure to note a physical reference, as once you leave a channel into a lake it can be hard to find again due to how the channel exit area blends in with its surroundings. Our next lake is Black Lake at 308 acres with a depth of 10-30 ft. The channel to this lake can be potentially hard to find as it blends in well with its surroundings. Sorry there is just no feature that stands out to mark the channel to this lake, however when coming from Harrison you will know you have passed the channel when you start to see a ranch with a series of white fences on your right (E.) or vise versus pass the white fences. Once in the channel you will have to pass under a bike bridge (4’ high, 8’ wide, with water depth of about 4’) with a Black Lake sign on it. Very tight fit for some mid draft boats to get under this bridge. When exiting from the channel there is a telephone pole in the water which is a good feature to use to help you find the channel again on your way back out. This lake has a deep and rocky shore line and with high hills almost all round the lake, quite stunning, and weeds on the east end. It also has the most homes around it out of all the chain lakes, yet this fact does not seem to distract from its beauty or wildlife; I saw my first beaver on this trip in the Black Lake channel. This is also an excellent fishing lake. It is also a nice lake to water ski/tube on but please stay in the middle of the lake so your boat wake does not annoy the lakeside residents. 5. Medimont Coeur d'Alene River Boat Launch... 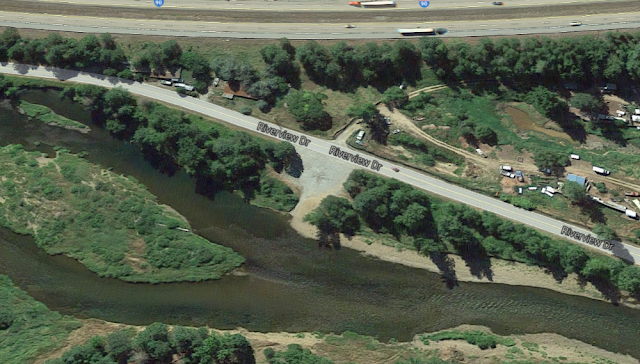 Toilets, Short paved boat ramp into river, no dock or running water, restroom, with large paved parking lot. Directions: 23 miles east of Coeur d'Alene on I-90, take exit 34 (Rose Lake), drive 13 miles on State Hwy 3, turn north/right onto S. Medimont Rd. 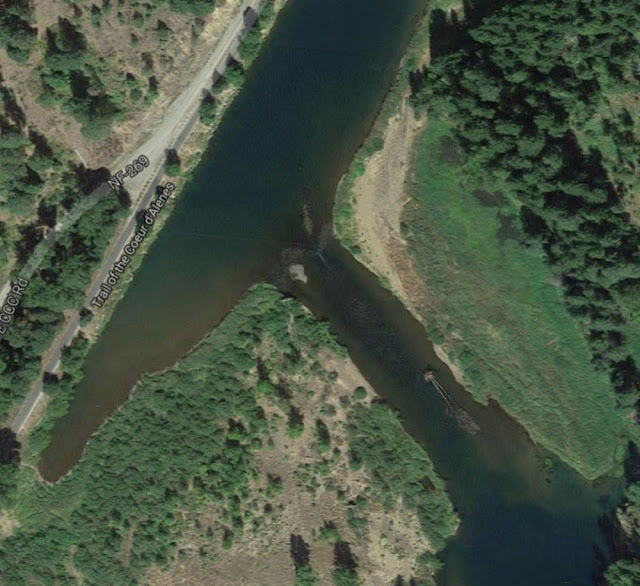 On this road after you cross the paved "Trail of the Coeur d'Alene" bike path and when the road turns sharply left take the small road on your right down to the boat launch area. Altitude: 2100'. 6. Rainy Hill (Medicine Lake) Boat Launch - Toilets, short paved boat ramp with 3 foot depth at end of launch pad. There is an additional boat launch on Medimont Road 1/2 mile further west right on the river and is a launch site only with no additional facilities. Last time I checked there is no fee at these two sites. Directions: 23 miles east of Coeur d'Alene on I-90, take exit 34 (Rose Lake), drive 11 miles on State Hwy 3, turn west on to E. Rainy Hill Rd. and drive 1 mile to boat launch area. Altitude: 2100'. Medicine Lake (340 acres) - "Access to Cave Lake via Medicine Lake." The next channel we enter after Swan Lake is the entrance to both Medicine and Cave Lakes. The entrance to this channel is right after you pass a large independent hill right next to the river (only such hill on the river) and there is also an area next to the channel entrance that is used for camping and launching of small boats (with a paved boat launch just about a hundred feet down stream, S. called Medimont Boat Launch) with no restroom, running water, or dock. This channel is deep (6’) and wide but like Swan Lake the channel has its limitations. The first obstacle you come to is a bike bridge with a limited area of 6’ high, 6’ wide (approximate) with depth of about 6’, after this bridge there is even a smaller bridge with a tunnel under it, with an opening of only about 4’ high, 6’ wide, and 3 foot water depth (the smallest such opening of all the chain lake bridges). Just before this bridge there are two smaller channels in view of the bridge which dead end into small ponds. When I went through this second bridge with my Hobie Adventure Island sail yak I had to of course drop my mast and fold in my outriggers. There is a shallow and primitive boat launch on this lake just after exiting the bridge tunnel with restroom but no running water (Rainy Hill Boat Launch). Medicine Lake is about 400 acres and is a popular fishing lake. Cave lake (see info below in next lake section) is accessed via this lake (Medicine Lake) via another bridge and short channel. After exiting the channel into Medicine Lake and as you pass the boat launch you look right (W.) you will see a bridge, this is the entrance into Medicine Lake. The channel is about 4-5 high, about 8 feet wide, and about 3-5’ deep depending on the time of year you visit. Like Anderson Lake it is one of the larger lakes and a really nice lake to enjoy the wind and open water on, a really nice sailing lake. There is no public facility on this lake but since the Medicine lake boat launch is so close to the entrance of this lake it's best to access the lake from there. This lake is mostly in the open (no hills near by) with of lots lily pads and grass along its shoreline. Killarney Lake (500 acres) is the deepest of the chain lakes at about 100 ft. 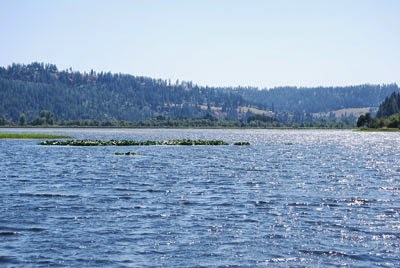 The channel to this lake is marked by a boat launch on the left (E.) side of the CdA River right at the entrance to the channel with the name of the lake on a very visible sign. This channel is long, wide (20’), and deep (6-10’) and in most cases wide enough for boats to pass each other safely (largest channel of the chain lakes). This lake also has two islands, one which is private (Hidden Island) on the southwest side. This island is on the westernmost shore is connected to a large wetland. To the N. is Popcorn Island (also known as Killarney Island). You may find it hard to find when you first enter the lake as it blends in well with its background. So head N. on the lake and you will find it. It’s a wooded dome shaped Island with one campsite on top and a dock on its N. shore with a sign that says, of course, Popcorn Island. It also has a nice trail that goes around it and some picnic areas. To the E. on this lake is a boat launch with dock (nice little channel that runs from the launch into deeper part of the lake), campsites, and restroom, very nice facilities (YES it has running water). 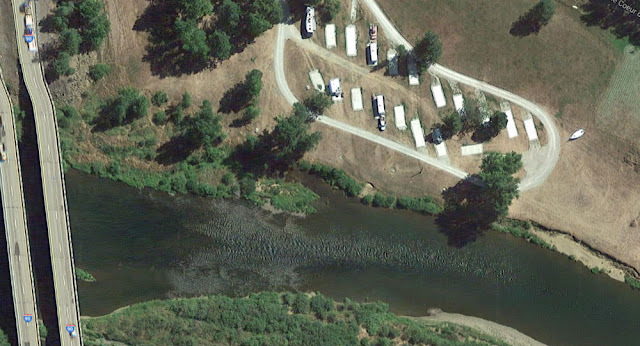 There is another camping area with dock a short distance from the boat launch with no launch facility (see more info below). This lake is great for any water sport activity. 7. 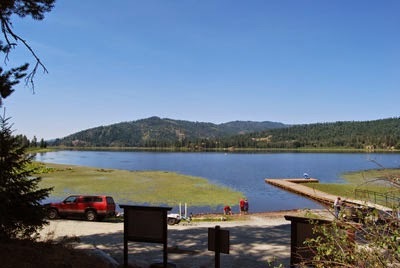 Killarney Lake Boat Launch - Concrete boat ramp, docks, paved parking and 12 primitive camp units are situated on the shore of the Lake (no hook ups). Drinking water is available from a hand lift pump. Camp units, water and vault toilet are accessible. Snow is plowed in the winter for ice fishing access. The last time I checked Fees for using this site is $8/site, plus $1/each additional person over 5 persons. Open year around. Directions: About 28 miles southeast of Coeur d'Alene, Idaho. US-90 east from Coeur d'Alene for 19 miles to the Rose Lake/St. Maries exit. Follow State Highway 3 south for 4 miles and take Killarney Lake Road to the right for 3.5 miles. Killarney Lake Picnic Site - This small site on the Shore of Killarney Lake has one picnic unit and two tent camping units. Access is by boat or a short foot path from the road. There is no drinking water. A pit toilet and one boat dock are provided. There is no fee to use this site the last time I checked and is open year-round. Directions: About 29 miles southeast of Coeur d'Alene, Idaho. US-90 east from Coeur d'Alene for 19 miles to the Rose Lake/St. Maries exit. Follow State Highway 3 south for 4 miles and take Killarney Lake Road to the right for 4 miles. Popcorn Island - This small, one-acre Island on the northern end of Killarney Lake is developed with a boat dock, vault toilets, one primitive camp unit and one picnic unit. No fees to use this site the last time I checked. Open: May through September. Directions: About 28 miles southeast from Coeur d'Alene, Idaho. Boat access only, nearest launch site is Killarney Lake. From Coeur d'Alene take US-90 east for 19 miles to the Rose Lake/St. Maries exit, follow Highway 3 south for 4 miles and take Killarney Lake Road to the right for 3.5 miles. Access the Island via the boat launch and head west of the lake. Hidden Island - This small, two-acre Island on the southwest side of Killarney Lake is un developed with no developed sites for camping. There is a primitive trail on the Island and spots one could camp. Please obey any use limit signs. Directions: About 28 miles southeast from Coeur d'Alene, Idaho. Boat access only, nearest launch site is Killarney Lake. From Coeur d'Alene take US-90 east for 19 miles to the Rose Lake/St. Maries exit, follow Highway 3 south for 4 miles and take Killarney Lake Road to the right for 3.5 miles. Access the Island via the boat launch and head west of the lake. 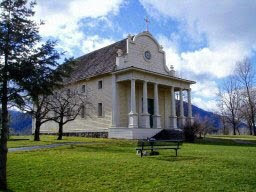 Coeur d’Alene Indians and Jesuits considered the site for the Mission sacred) includes a boat launch, docks, and park with restrooms and running water and interpretive center. The boat launch is right at a big bend in the river, which has created a very deep pool so even in the summer you can launch from this site. 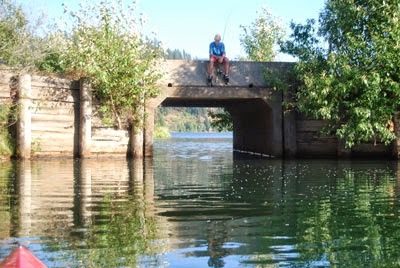 However, in late summer and early fall you may be backing your trailer over a lot of rocks to get to the water so if you have a big shinny boat you may want to launch a little further down the river preferably in Harrison. Up river from the Mission is where the rapids are but there are no rapids down river from this Old Mission launch. From the this boat launch to Harrison it is about a 22 miles boat trip. Directions: To access the Old Mission boat launch take exit 39 off I-90 and follow the frontage road past the Mission entrance on (S. Mission Rd). Maps: View Google Map above. There are two other lakes you may hear about during your trip to the Chain Lakes and so I wanted to give you quick synopses about them. Porter Lake/Pond (50 acres) which is really more like a pond than a lake and is immediately south of (below) Rose Lake at about 50 acres when full. It will not totally dry up in late summer early fall but will come darn close, so it’s not really good for any water sport activities. There is of course no public facility on this lake and so kayaks and canoes are the boats of choice for this pond. I guess you could access the pond from HWY 3 via pushing your way through the grass and paddling your way through the lily pads. It is almost totally covered in lily pads with some open water right in the middle. Maps: View Google Map above. Power Boaters Please Be Aware! 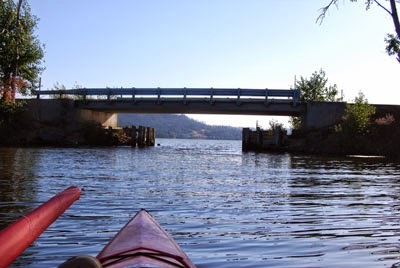 I wanted to makes a special note related to boating at unsafe speeds in any of the chain lake channels and Coeur d’Alene River because while I was kayaking in one of these channels I almost got ran over at a sharp turns in a channel. I was so surprised to see a boat going so fast (about 20 mph) in such a narrow channel and totally disregarding any level safe boating sense. Also going too fast and creating a large wake in any of the channels causes’ significant erosion. Be kind to other boats, be aware of the damage you can do via your wake related to erosion, and specially be safe. If you see a boat operator operating a boat unsafely write down their hull registration number and report it to the Sheriffs Department. · Speed Limit on Lakes: Day - 50 mph; Night - 20 mph. · Speed Limit on Rivers: Day - 35 mph; Night - 20 mph. · No Wake Zone (5 mph) on Lakes: Within 200' of shoreline, dock, pier, breakwater or person in the water. · No Wake Zone on Rivers: 100'. · Adult supervision is required when an operator of a boat or other vessel is between the ages of 10 to 14 unless the motor is 15 horsepower or less. · Children aged 14 and under must wear a U.S. Coast Guard approved life jacket when they are aboard a vessel 19' long or less when the vessel is underway or under power. This applies to manually propelled boats as well as motorboats. CAUTION: Swimming on and eating fish from the Coeur d’Alene River notice! 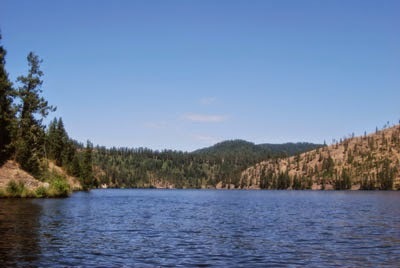 Up river on the Coeur d’Alene River is was known for years of mining and thus contaminants such as lead have traveled down the river for years and thus sportsmen accessing the river system and chain lakes should know about the potential health hazards. 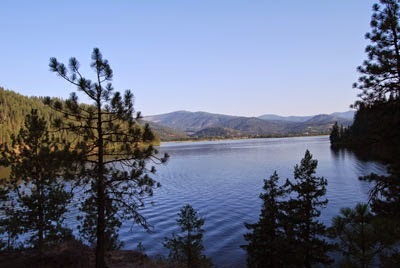 Official Quotes: The Frequency of exposure to containments such as lead and other negative compounds in the Coeur d’Alene River Basin would probably be low, however the potential for health concerns is generally low as well. 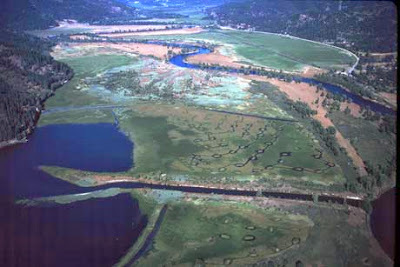 The Concentration of contaminants, in most locations within the Coeur d’Alene River Basin, is not at levels which could represent a human health threat. However it is not recommended that you eat fish from the Chain Lakes area.